An Afghan official says Pakistan's intelligence agency must have known that al-Qaida leader Osama bin Laden was hiding in a house close to a Pakistani military academy before U.S. special forces killed him in a raid on Monday. Speaking at a news conference Wednesday, Afghan Defense Ministry spokesman Zahir Azimi said the location of the house in the military garrison town of Abbottabad would have ensured that Pakistani authorities knew who was living there. Azimi said bin Laden's hideout would have been known not only to a "strong" intelligence agency such as Pakistan's ISI but even to a "very weak government with a weak intelligence service". He said the ISI faces many questions that need answers. 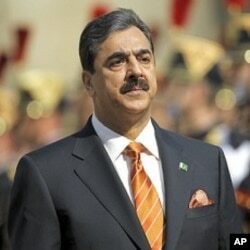 Pakistani Prime Minister Yousuf Raza Gilani said bin Laden's ability to live undetected in the compound, apparently for years, "is an intelligence failure of the whole world, not of Pakistan alone." He made the comment Wednesday during a visit to Paris. U.S. officials also have demanded answers as to how the al-Qaida leader could have lived at a luxury complex in Abbottabad without the knowledge of Pakistani authorities or help from a support network inside Pakistan. The area around the compound remained sealed off Wednesday by Pakistani police and soldiers. Pakistan says it had no prior knowledge of bin Laden's location. It also expressed "deep concern" that the United States conducted the raid in Abbottabad "without prior authorization" of Pakistani authorities and said such an "unauthorized unilateral action" should not set a precedent for other nations. The White House released new details Tuesday about the U.S. special forces operation that killed bin Laden. Spokesman Jay Carney said bin Laden was not armed, but resisted the Navy SEALs who raided the compound where he was hiding. Carney said resistance does not require a firearm, but he did not give further details.